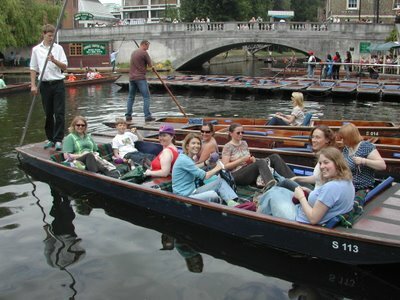 Thanks to all the punting knitters for an extremely pleasant afternoon! You can read all about it on my blog. And I'm sure there'll be a few more reports as well! I've got through on the phone and booked the punt, at last. It's going to be a very busy day, and they are already booked solid from 2-7 pm, so we had to take 1 pm. I hope this doesn't inconvenience anyone! We'll leave from Mill Lane, just by where the knitters meet Saturdays. Plan to get there around 12:45, so we can all find each other. There are a few names I don't know any faces for, but we will all have our needles and yarn as calling cards, so I hope there won't be any trouble! The cost is 11 pounds a person, payable to me, Mary. Please don't all give me twenties! I'll try to have some change, but of course, exact money is always appreciated. And there will be prizes! At least one prize, anyways... If anyone wants to give a ball of yarn or something, bring it along, and we'll draw names to win. Okay folks, here's the lowdown on the punting. It's waaaaay cheaper to get a punt and a pole and do the work ourselves. So if you wouldn't mind punting a bit, or if you have a big strong friend who would punt us for beer or wool or a modest amount of cash, speak up now. If you want to go toward Grantchester, it would be 270 pounds for a 4-hour return trip -- they'd take us, let us have a picnic or whatever for 90 minutes, and bring us back. Sounds lovely, but unless anyone's won the lottery, I think that's beyond our price range! To punt ourselves on the Backs, it'd be 16 pounds/hour/punt (so about 2-3 pounds/ person/ hour), and we'd likely have to get 2 smaller punts. Discounts with Leisure cards or Cam cards. 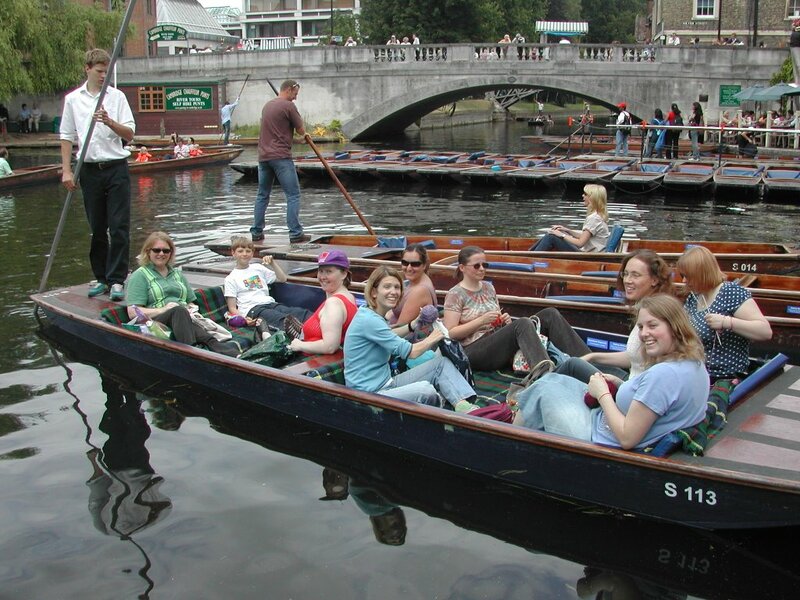 And, if we book soon, we might be able to get a big punt we can all fit in, and it'd be 140 pounds for all day (pick-up before 2 pm, back by 9 pm) and that'd be on the Grantchester route, so we can go as far as we are able, take a picnic, not be hurried, and it's only 14 pounds/person if we punt ourselves! Leave a comment, and I'll book it this weekend. My vote would be for the 60-minute chauffered trip, or the all-day punt-ourselves big boat, but I am not a great punter and don't actually volunteer to punt much! They like to get the full payment up front, or at least a 50% deposit. So if you say you are coming, you are also agreeing to pay your share. We're really pushing the boat out this month (literally and metaphorically). 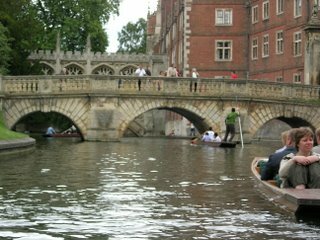 Two Tuesday evening get-togethers and a knitting and punting trip. 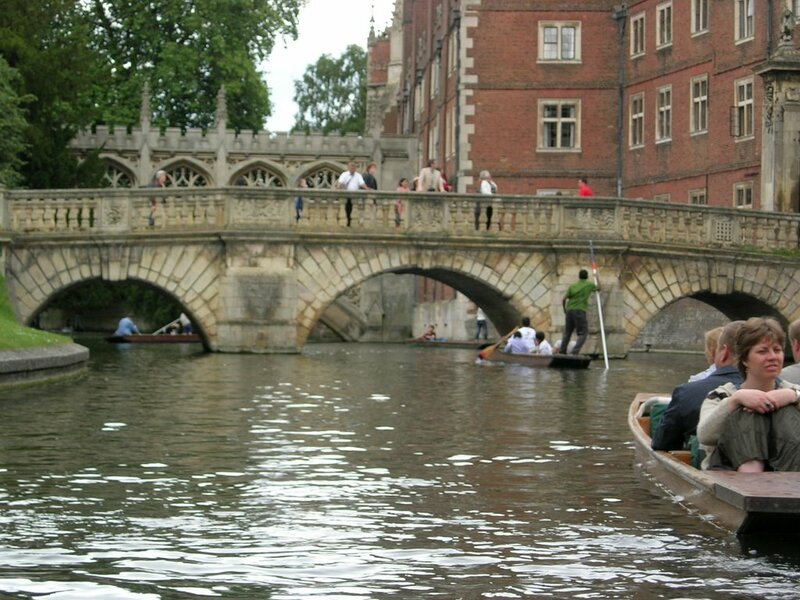 The Tuesday dates are 13 June, 7-9pm, Granta Bar, Unviersity Centre (or if the football is on, catch us in Grads Cafe, on the top floor) and 27 June, 7-9pm, Cambridge Blue (yay! ), Gwydir St. 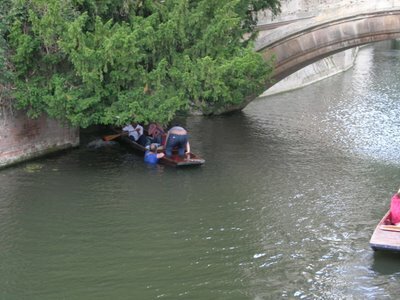 The punting trip is going to be on Sat 24 June and Mary will be posting more details on this. Booking by 17 June, please.